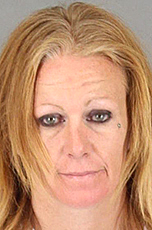 A Murrieta woman linked to several vehicle burglaries in Murrieta and Temecula was arrested Wednesday as she appeared in court on an unrelated matter, authorities said. Janece Fiechter, 40, was identified by detectives with the Riverside County Sheriff's Department as a suspect to numerous burglaries, according to a Sheriff's Department news release. An investigation showed that the suspect also used stolen credit cards from those burglaries to make purchases at various businesses. Detectives located Fiechter at the Southwest Justice Center and placed her under arrest for vehicle burglary, credit card fraud and possession of stolen property. Additional evidence was collected. She was booked at the Southwest Justice Center and is being held on $90,000 bail.